Genesis Evolution Maxx Orange 4 oz. Genesis Evolution Refresh Purple 4 oz. Genesis Evolution Hydro Blue 4 oz. 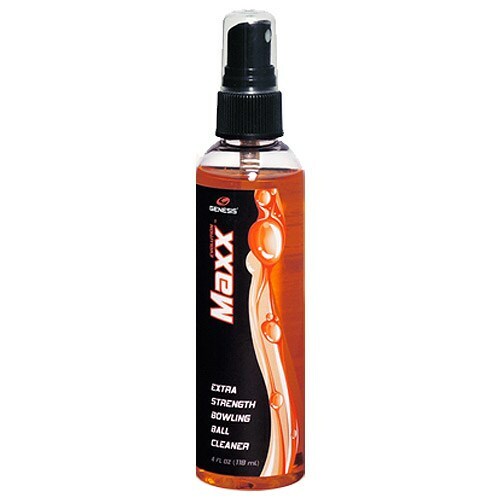 Evolution MaxxTM is Genesis' bad boy solvent based ball cleaner. They call it "Extra Strength" just because it's stronger than their other cleaners. Except nicks, gouges, or cracks, this cleaner is guaranteed to remove any contaminant from the surface of the ball. The solvent base effortlessly penetrates deeper than traditional water based cleaners, then quickly evaporates to lift and expel lane oils from the surface. Strictly not for use during sanctioned competition, this cleaner is sure to become a legend! Safe for use on all ball types, even polyester! The Maxx orange is just that. Maxx cleaner. Maxx results. Maxx smell. This is a solvent based cleaner and only approved before or after play. It works great and does not take a lot of elbow grease to do its job. I've used this cleaner after play and it takes off even the nastiest of belt marks and grime. Being solvent based it has a very strong nail polish remover smell to it. Best to use where there is some air space. Probably want to use gloves as well or atleast wash your hands afterwards. This is my go to when other cleaners won't cut it. Due to the time it takes to produce the Genesis Evolution Maxx Orange 4 oz. ball it will ship in immediately. We cannot ship this ball outside the United States.